We have a team of LEEA approved lifting inspectors who can conduct six monthly, twelve monthly and forty eight monthly inspection at our rigging yard in Muscat or at your location. The units are specifically designed and built to carry out safely and efficiently the services required by international standards and regulations for refilling of all types of fire extinguishers. The air from the compressor which is used to charge the SCBA sets are closely monitored using the Air quality test kits as per COSHH regulations. We Manufacture, Test and Certify, Quality Lifting, Rigging and Height Safety equipments for clients in the Mining, Rigging, Construction and engineering markets. We have positioned ourselves as one of the leaders in safety services in the region and beyond. Building on more than 20 years of experience, STS provides its clients with safe and cost-effective services through the combination of a well motivated workforce led by a dedicated management team with the latest modern equipment and pioneering technology. We deliver quality products & services, keeping in mind that “Safety isn’t expensive it’s priceless”. Across the region, STS has a strong presence in the field of: Inspection, testing and certification of lifting quipment and lifting gears. Manufacturing, testing and supply of wire rope slings, nylon belts, lifting chains, cargo nets, lifting hooks... Supply, installation and servicing of fire and gas detection systems Supply, installation and servicing of fire and safety equipment Provision of HSE training, Defensive Driver training, Lifting equipment operator raining and management training services. Lifting Inspection Services, SAFETY technical SERVICES is a full member of Lifting Equipment Engineers Association LEEA and we provide various inspections, testing and certification for all the lifting equipment and loose lifting gears. We have a team of LEEA approved lifting inspectors who can conduct six monthly, twelve monthly and forty eight monthly inspection at our rigging yard in Muscat or at your location. Inspections are carried out in compliance to LEEA codes of practice, Lifting Operations and Lifting Equipment Regulations LOLER, Provision and Use of Work Equipment Regulations PUWER, BS EN Standards & Petroleum Development of Oman - PDO guidelines and procedures. Read More..
SAFETY technical SERVICES aims to be the leading supplier of gas detection equipment for the protection of personnel and facilities around the Middle East. With a full line of portable and fixed gas detection system, we have brought safety to the forefront. We use the latest in sensor technology and field-proven principles to provide peerless detection of toxic gases, combustibles and oxygen hazards. Our feature-rich detectors are designed for ease of use, intuitive operation and extraordinary cost of ownership advantages. Read More..
SAFETY technical SERVICES is working as a whole, to consistently improve on our goal of satisfying customers needs with the highest “Quality and Service” through ISO 9001:2015. We at STS continually monitor systems and procedures to maintain our high standards of Safety and Quality for Customers services and for order fulfilment. 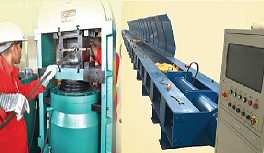 Read More..
To enhance our quality of service, the 1250T wire rope crimping machine is used to make wire rope slings efficiently up to 60mm diameter. The model YT1250 is made as one column structure of alloy steel to have more strength and rigidity. To verify the specifications and requirements of the clients are met, our lifting products are tested in our 200T tensile testing machine. The tests are controlled by digital closed-loop control system with control software- SMART TEST. The results of Safe Working Load, Proof Load Tests and Break Load Tests are generated at the end of each test with graphs showing load applied on y-axis and time taken on x-axis with the description of lifting tackle, its specifications, Load applied etc. Read More.. Maintenance of your fire and safety equipment is absolutely essential for the safety of life and property. Your fire and safety equipment could sit for long periods without being used, but when you need to use it, it needs to be fit for the purpose of saving life and property, so don’t take a gamble. We at SAFETY technical SERVICES Co. LLC. carry out our cost effective, qualified and country wide maintenance of all fire & safety equipment. Our service team has years of experience in maintaining / servicing and recertification of all types of fire and safety equipment. Our qualified engineers and technicians offer a service package that’s designed to ensure your safety and peace of mind.Read More..
A safe working environment is an essential factor for every industry and organization in the 21st century. Choosing the right company to deliver safety training to your staff is equally essential and this is why SAFETY technical SERVICES is the preferred provider for many companies and groups within the Middle East and beyond. Our instructional team are qualified vocational assessors and qualified internal verifiers. Our training program delivery is through instructor-based course facilitation and where practical candidates learn through “doing” in general. Our training sessions include formal presentation, prepared in Power Point, interspersed with directed discussions, active audience participation through the use of problem-solving exercises, group discussions and analysis of case studies. End of course attendee evaluations form an integral part of our course delivery methods. STS efforts towards creating a safe and healthy workplace were rewarded in 2010 by British Safety Council International Safety Award and we are proud of the professional associations with NEBOSH, EMTA Awards Limited accreditations and approvals from Petroleum Development of Oman-PDO and other international bodies it has secured over the years, providing reassurance to our existing clients and peace of mind to new and potential customers.Read More..
Motor vehicle crashes are the no.1 cause of fatalities and the leading cause of death for ages 2-39 and ages 50-72. 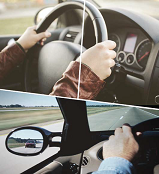 Plus, the increasing number of new drivers and vehicles on the road creates a continuing need for defensive driving training across all age groups. STS is a leading provider of defensive driver training in the middle east and have developed a series of training programs for the experienced motorists. Most people don't know what's expected of them when they get behind the wheel. A refresher course will help to make the decision to look beyond the ordinary and expect the unexpected! Let the experts with 20 years of combined experience guide you down the road to a safer tomorrow. The role of a professional driver has become more demanding over the years, none more so that those who operate large, heavy goods vehicles. It could be argued that they are not 'drivers' but operators of dangerous machinery! our trainers specialize in light, rigid and articulated vehicles based upon the driving Standards Agency (UK) syllabus. Our courses aim to produce a knowledgeable safe driver who will produce a smooth, skillful drive with responsibility and the 3 C's - Care, Courtesy & Consideration.Read More..